This entry was posted on Friday, October 31st, 2008 at 12:45 pm and is filed under domestic, Just wondering. You can follow any responses to this entry through the RSS 2.0 feed. You can leave a response, or trackback from your own site. 6 Responses to Over or under? About twenty five years ago the Australian prestigious magazine ‘The Bulletin’ ran a piece on this topic and invited comments by way of letters to the editor. The commentary went on for over two years, if my memory is right. Sadly, The Bulletin was closed last year. It was a wonderful read to which I subscribed for nearly thirty years. The main thing is to have a colour that goes with brown. My research shows that males favour the over method and females the under. Strange but true. 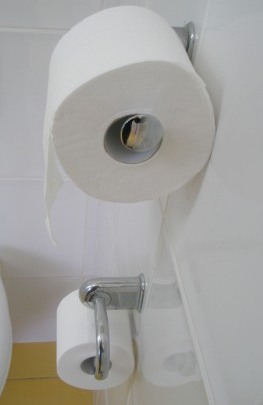 Just give someone a toilet roll to load onto the holder and see the result! i found to my suprise, when I relocated to NZ that the under method is favoured, quite the reverse in the UK (a bit like water down plug-holes?) So I think it is a cultural thing. JC don’t agree about it being a cultural thing. Pete I agree it is a man/woman thing. When I change a roll I have the paper coming over the top. When my wife does whe has it coming underneath. Even if I turn them around, as I do from time to time, she changes them back. We have never discussed it that I can recall but I put it down to her wanting it to by tidy by having the paper hanging down against the wall – I doubt it is to save paper. Apologies JC – I meant Lee C.